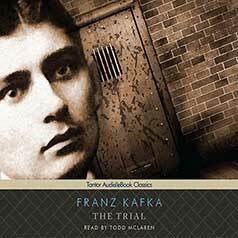 First published in 1925, The Trial, one of Franz Kafka's best-known works, tells the story of a man arrested for an unknown crime by a remote, inaccessible authority and his struggle for control over the increasing absurdity of his life. First published in 1925, The Trial tells the story of a man arrested for an unknown crime by a remote, inaccessible authority and his struggle for control over the increasing absurdity of his life. One of Franz Kafka's best-known works, The Trial has been variously interpreted as an examination of political power, a satirical depiction of bureaucracy, and a pessimistic religious parable. Left unfinished at the time of Kafka's 1924 death, The Trial is nevertheless a trenchant depiction of the seemingly incomprehensible nature of existence and a fascinating exploration of the universal issues of justice, power, freedom, and isolation. © 2019 Tantor Media, Inc. All Rights Reserved.